Regina resident and writer Jes Battis. Jes Battis is the author of a series of novels featuring protagonist Tess Corday, an occult special investigator who lives and works in Vancouver. His first book, Night Child, was shortlisted for the 2008 Sunburst Award for Excellence in Canadian Literature of the Fantastic. In addition to his creative work, Battis is an Associate Professor who teaches in the English Literature and Creative Writing programs at the University of Regina. In the academic world, Battis has authored and edited a number of monographs and collections, including most recently Mastering the Game of Thrones: Essays on George R.R. Martin’s A Song of Fire and Ice (McFarland, 2015), which he co-edited with U of R professor Susan Johnston. Originally from British Columbia, Battis has found inspiration in his adopted home on the prairies. Under the pen name Bailey Cunningham, Battis authored the 2013 fantasy novel Pile of Bones: A Novel of the Parallel Parks, which is set in Regina. “Before the arrival of settlers in the 1880s, First Nations hunters came to the area to hunt the roaming herds of buffalo. They used nearly all of the buffalo they killed for food, shelter and clothing. Only the bones remained. The Cree word “Oskana” gave Regina’s “Wascana Park” its name. 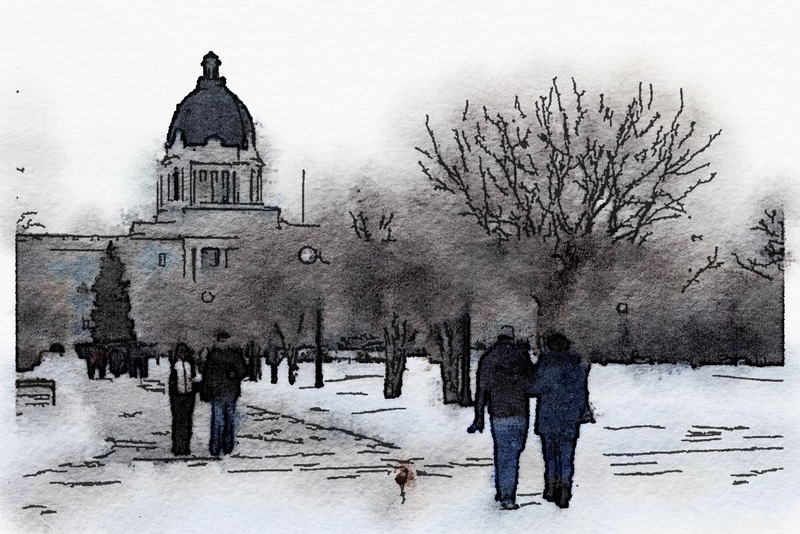 Wascana Park is the site of the Saskatchewan legislative building, at the heart of the city. If you would like to learn more about the story behind Regina’s original name, Greg Beatty’s article “Skeletons in Regina’s Closet” from Regina’s Secret Spaces reveals that the actual site of “Oskana” is likely several kilometres northwest of Regina. The pile of bison bones potentially included human remains of Assiniboine people, who had fallen victim to a smallpox epidemic (Beatty 67). In our journey to discover more about Regina’s literary culture and fare, we thought you would enjoy hearing some of Battis’ reflections on the city and his fantasy novel, Pile of Bones. SB: Thanks so much, Jes, for agreeing to do this “spotlight interview.” I know it’s a busy time in the semester. I hope the weather is warming up in Regina now that spring is in the air? JB: Thank you so much for extending the invitation to chat. We had a false spring a few weeks ago, and now the snow is back. As you know, spring is a blip in Saskatchewan. But as soon as the needle rises to about -5, people are wearing shorts in celebration. We truly appreciate non-fatal weather when it arrives. Since moving from BC over 5 years ago, I’ve had to revise my notion of ‘nice weather,’ and now I’m just extremely grateful when there isn’t frost inside of my apartment. SB: I’m excited to talk to you, as I think your novel Pile of Bones really pushes readers and Regina residents to view this prairie city in new and illuminating ways. Why did you choose Wascana Park for the setting of your book? Did your perspective on the park change after writing your novel? JB: A friend and colleague, Jeet Heer (whose book Sweet Lechery was just released by Porcupine’s Quill), told me how Wascana Park used to be a spot where the Plains Cree people left buffalo bones to dry, hoping they’d act like a ghostly beacon to attract more buffalo. I was fascinated by the idea that this ossuary had become a man-made park, complete with a miniature bridge and a legislative building hemmed in by dammed waters. It made me think about the uneasy contact point between the urban and the wild, and that gave me the idea that Wascana Park might be haunted by all sorts of things, benevolent and not so much. I wanted to keep in mind the reality that this was borrowed land, laced through with complex histories, and that we were all sort of tourists there. It also, frankly, reminded me of the terrain from the computer game Myst, and I wanted to write an unstable portal fantasy, where the surface keeps shading into something darker underneath. By the end of the series, the park came to represent a social contract between various species and realities, and the characters came to the recognition that (to quote Leonard Cohen) “magic is afoot” in their daily lives. SB: When the characters (Andrew, Shelby, Ingrid, and Carl) are transported to the world of Anfractus, readers encounter some impressive banquets. I’m thinking of one scene in particular that features exotic delicacies: “dormice rolled in honey, sausages grilled on braziers,” fish swimming “in hot sauce, next to rabbits decorated with caps and wings,” and the main course: “a massive pig, roasted together with her babes still attached to her teats” (154). What was your inspiration behind these fantastical feasts? You seem to enjoy describing the ingredients and menus. JB: My primary influence for this was Trimalchio’s feast in Petronius’s Satyricon. My colleague Garry Sherbert introduced me to this text, which launches an attack on the values of Rome during Nero’s reign, while simultaneously making that era seem like a lot of fun (if you happened to be a wealthy patrician). The feast scene is supposed to encompass Roman excess, but there’s also a curious, almost technical beauty in the preparation of these gorgeous hybrid-dishes: suckling piglets, birds baked in enormous structures, a whole universe of different sauces. The Romans seem to have appreciated the contrast between sweet/sour, and they prized a fermented fish sauce (“garum”) that would make us gag. I wanted to stress the alien feel of those dinners, and to remind readers that Anfractus has its own culture, which in some ways resembles late-Rome. I was also aided by the historian Alberto Angela’s book, A Day in the Life of Ancient Rome, which included recipes. SB: In the everyday world, your main characters are graduate students attending Plains University. We often see them eating convenient, inexpensive fare: coffee, food court soup (chicken and barley), and portable snacks. At times, these ordinary foods seem to communicate the students’ desires for another world of adventure, for other identities. For example, Andrew’s coffeemaker looks like “a replicator from Star Trek” (25). Later, when he plays with his salad croutons at the university’s cafeteria, he soaks them in pickled beet juice so “he could pretend that they were alien food cubes” (35). One morning when he picks up Shelby at her apartment, he has the barista write “Carlotta” on the cup because he “thought it sounded empowering” (98). In your novel of “parallel parks,” is there a relationship between how your characters inhabit or “consume” their two worlds, especially since the nighttime world of Wascana-turned-Anfractus is all that more dangerous when it “closes its jaws” (74) around them? I find it fascinating how their two worlds merge. JB: That’s a really interesting question–I hadn’t really thought of this difference before. Certainly, eating in Anfractus becomes about ritual. The texture of the world is like a living RPG, within which characters have to forge alliances and complete quests. Eating binds them together, provides gossip, opportunities, but it also separates the rich from the poor. In Regina, the grad-student characters are living in what we call “relative poverty,” in that they can afford their rent, but not much else. If they moved to a more suburban area, they might save money, but they’re all dreaming of lives in the middle of a city, and that’s part of their dilemma. They’re not quite sure who or what they want to become, which is sort of what it feels like to be a grad student–you’re expected to make your own decisions, but you also have this committee who makes decisions for you. I’m embarrassed to admit that I still eat like most of the characters–whatever’s within reach, whatever I can hold while typing. I guess that the characters think they’re entering into some stream of the epic, but they slowly realize that there isn’t much separating Anfractus from the “real” world. It all comes down to the choices they make. 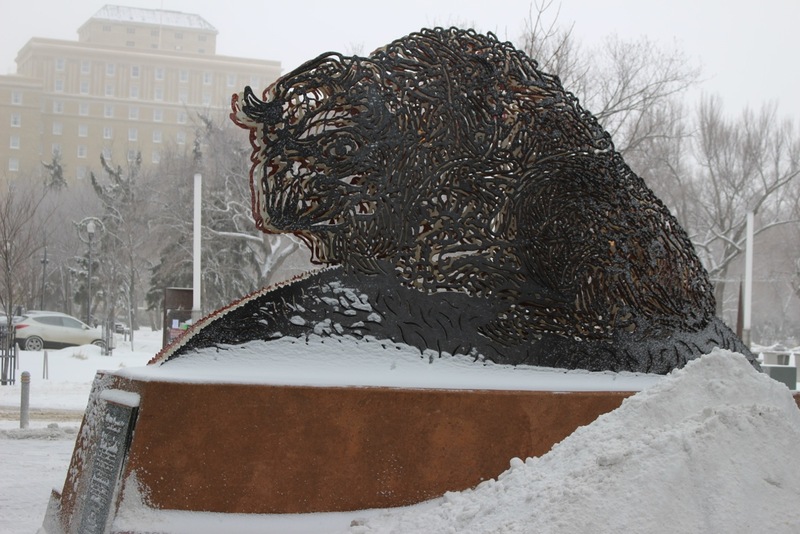 Joe Fafard’s “Oskana” sculpture on Scarth Street in Regina. In Pile of Bones, the character Andrew contemplates Joe Fafard’s work of art while walking through Regina’s downtown: “Shelby’s place was on Scarth Street, in the middle of pedestrian mall. A metal buffalo stood at the entrance, with the word Oscana carved into it…. Reading a lot of E. Nesbit as a kid had taught him that statues often came to life at night, and it didn’t hurt to be respectful” (Cunningham 28). SB: Your characters primarily reside in the Cathedral Village neighbourhood and downtown area of Regina. Some of their favourite coffee haunts are Atlantis and Roca Jacks, which are real places located on Victoria Avenue and 13th Avenue, respectively. Do you have any favourite food destinations in Regina? How would you characterize the city’s local cuisine? JB: For its size, Regina has a number of excellent restaurants. I practically live at the Green Spot Cafe on Hamilton St, which is vegetarian and provides a lovely atmosphere (I thanked them in the acknowledgements to Path of Smoke). The newly-opened Caraway Grill has amazing chicken korma, and Siam (also downtown) has Thai corn fritters that are life-changing. Shanghai Lily also serves an eclectic mix of Chinese dishes, and they operate out of an old house, conveniently located a few blocks from my apartment. The Slow Pub, on Albert and Thirteenth, has surprisingly great food for a pub, including tortilla soup and patatas bravas. SB: Thank you for taking the time to answer these questions, Jes. I hope Regina continues to inspire some of your future work. JB: It’s been a pleasure–thanks for giving me the opportunity to talk about my work! I’m currently working on a new novel inspired by Anglo-Saxon and Norse paganism. The culinary options are unlimited! Beatty, Greg. “Skeletons in Regina’s Closet.” Regina’s Secret Spaces: Love and Lore of Local Geography. Ed. Jeannie Mah, et al. Regina: Canadian Plains Research Center, University of Regina, 2006. 66-67. Cunningham, Bailey. 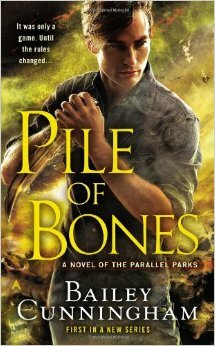 Pile of Bones: A Novel of the Parallel Parks. New York: Penguin, 2013. Print. This entry was posted in The CanLitFare Blog and tagged alien food, Anfractus, Assiniboine, Atlantis, Bailey Cunningham, barista, beet juice, bison, buffalo, Capital Meals, Caraway Grill, chicken and barley soup, chicken korma, coffee, coffeemaker, Cree, croutons, dormice, food, food court, garum, Green Spot Cafe, Greg Beatty, honey, hunting, Jes Battis, Literature, patatas bravas, piglets, Pile of Bones, Pile of Bones: A Novel of the Parallel Parks, rabbits, Regina, Regina's Secret Spaces, Roca Jacks, Roman meals, sauces, sausage, Shanghai Lily, Siam, Skeletons in Regina's Closet, Thai corn fritters, The Slow Pub, tortilla soup, Wascana Park. Bookmark the permalink.